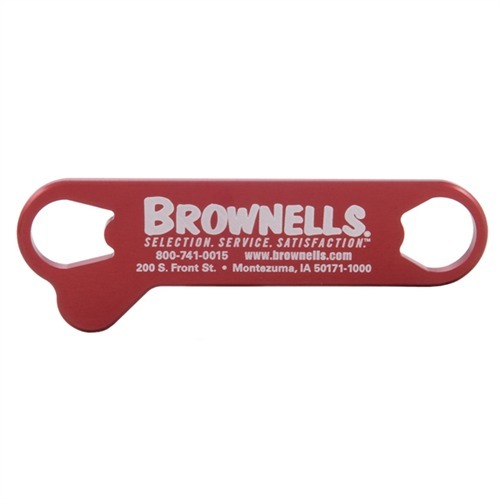 The perfect tool for every 1911 owner’s range bag or cleaning kit. Precision machined for a close fit to Government Model and Officers bushings. The extra thick, contoured handle fits comfortably in your hand; has plenty of heft for a good, solid grip. Turns the tightest bushings without slipping. Enhanced model has a handy flange that retains the recoil spring plug as you twist the bushing free. No more flying springs or plugs! SPECS: Aluminum, red anodized. 5½" (14cm) long, 1¼" (3.2cm) wide, ¼" (6.35mm) thick. Det perfekte verktøyet for hver 1911 eierens rekke bag eller rengjøringssett. Presisjon maskinert for å passe til regjeringens modell og offiserer foringer. Ekstra tykk, formet håndtaket sitter godt i hånden; har mange heft for en god, solid grep. Viser strammeste foringer uten å skli. Forbedret modellen har en hendig flens som beholder rekyl våren pluggen som du vrir foringen gratis. Ingen flere flygende kilder eller plugger! Spesifikasjoner: aluminium, rød eloksert. 5½"(14cm) lang, 1¼" (3.2 cm) bred, ¼"(modellene mm) tykk. great tool for field stripping /removing bushing, tab helps to keep spring from flying out for disassembly, must have for replacing the bushing. It's easy to develop a technique where the wrench is placed on a firm flat surface and the 1911 is pushed down on the wrench. A simple twist will insert of remove the plug very safely. Stop cursing your tight-fitting Les Baer. Instead, buy another. Don't waste your money on any other wrench. This is the best I have ever used. Tool is extremely well made. Plastic wrench didn't last but one time, this one will probably last for life. Bought several plastic offset bushing wrenches for use on my 10mm pistols as the spring ratings on them are very high and controlling the recoil plug during disassembly and reassembly was exciting at times. The plastic ones are OK but they flex when applying the pressure necessary to control a high rated recoil spring. This one is tough enough to handle the job. Get this and it'll handle anything you can dish out. I am generally an extremely frugal person, and I admit I initially had some misgivings about paying this much for a bushing wrench. Those misgivings were erased the first time I used it. It should last a lifetime and the additional little notch really helps with Dan Wesson assembly. Buying this IS being frugal, it'll never need replacing and time is money. It really is all they say. The Kart bushing on my Rock River Arms 1911 is as tight as they get. 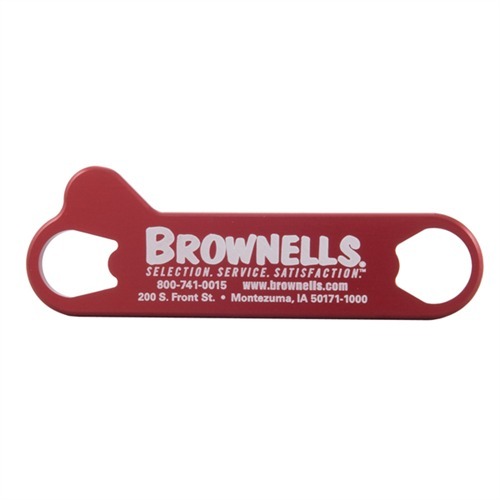 I've destroyed several of the "Cant Mar" synthetic wrenches and another aluminum wrench trying to wrestle my bushing off before I purchased one of these. Worked like a charm and didn't leave a mark on my parkerized bushing. Great wrench....worth the extra cost. This is the Cadillac of bushing wrenches, no doubt about it. It fits comfortably in the hand, with gently rounded edges. It allows a firm grip without cutting into your hand. I had made it through life with a "synthetic" (plastic ... polymer ... whatever term you like) bushing wrench. Then I ran into a pistol with a tight - and I mean really tight - bushing. Not sure how the original gunsmith got it on. That's when I got religion and bought 2 of these. Sure, they're pricier than the plastic versions, but when the plastic versions break, you'll appreciate this one. Anodized Bushing Wrench 050806102880 Det perfekte verktøyet for hver 1911 eierens rekke bag eller rengjøringssett. Presisjon maskinert for å passe til regjeringens modell og offiserer foringer. Ekstra tykk, formet håndtaket sitter godt i hånden; har mange heft for en god, solid grep. Viser strammeste foringer uten å skli. Forbedret modellen har en hendig flens som beholder rekyl våren pluggen som du vrir foringen gratis. Ingen flere flygende kilder eller plugger!